Using the GPLed linux driver with the Belkin F5D6050 Adapter. Go to my main wireless page for pictures.... this all needs an update which I will get to doing where time permits! If you have a Netgear MA101 USB device, try http://www.mckinney.co.nz/wireless/gpl-driver.html for more information. a Belkin F5D6050 USB wireless device. Have a look here to see what kind of board you may have, or have a look at ./src/includes/usb/config.h once you've downloaded the source code. Internet access from the computer you are building the driver on so you can fetch the source code from cvs. Or see below. Note, the USB adapter I used was running with a usb-ohci.o module. You need cvs installed for this. Its on the RedHat install CDs if its not installed already. run: cvs -z3 -d:pserver:anonymous@cvs.atmelwlandriver.sourceforge.net :/cvsroot/atmelwlandriver co atmelwlandriver as one line. You can download an "old" file from here (atmelandriver.tgz - 604Kb) if you prefer the CVS tarball I used. build debug version? yes - ONLY IF YOU WANT A LOT OF SYSLOG MESSAGES. Plug in your Belkin F5D6050 usb device. Check the syslog output - it should show that the device was plugged in to the bus. Install the Atmel driver - Use modprobe usbvnetr. I have found that installing the Atmel driver before plugging in the device results in the whole thing just stopping at "resetting usb device" and it goes no further. You should get some messages in syslog to say the device is registered and also some to the console. Sep 17 23:32:22 machine kernel: vnet_kernel.c: Reset completed. 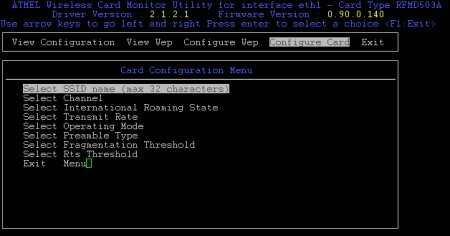 Then run lvnet to configure the card. It should open a configuration screen. Set all the parameters and then exit the configuration program. If you downloaded the driver via CVS, whenever you want to get the latest source code from cvs, go into the atmelwlandriver directory, and run: cvs update. Then run: make clean, then make config ; make install to recompile the driver. Next, install wireless tools package to configure things using the command line. I don't know how well this works but I am still looking at it.